This is the true electrical VS Third Lung Diving System for a yacht. Powered by the boat via the AC power pack (115/230 vac compatible) the system will support one, two or three divers for hours of diving around the boat.The diver supply hose can be routed out a door or hatch, or plumbed out a thru-hull fitting. For the ulimate in convenience, upgrade the hookah system with our E-REEL - providing up to 150ft of diver supply hose, but with the added benefit of powered hose recoil. 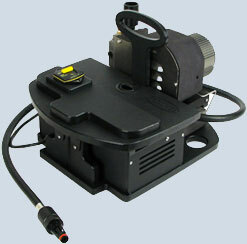 Just push a button and the supply hose is retracted and stowed out of sight, preserving valuable deck space. Includes: motor/compressor assembly on mountable base, AC Power Supply (115/230vac), air intake, 5 ft heat hose with easy-clean in-line particle filter, Owner’s Manual.